well well Truro again, I would not be surprised if this is the only location these will appear from. As a number of NCR machines were touted as being in service by last December, RM could have taken the view that a number of roll should be produced with the NCR sized cores. Had theses been from any office other than Truro, we would have accepted them without question, but because of the oddities which surfaced with the birds 3 labels that came from that office we assume mischief is afoot. We can’t also rule out that in an attempt to reduce waste and costs, it was considered wiser to re-manufacture the rolls of recent printing to the new core size. If they turn up in another office outside of Cornwall & Devon we will have our answer, if no more examples turn up then the suspicion of strange goings on at Truro will persist. 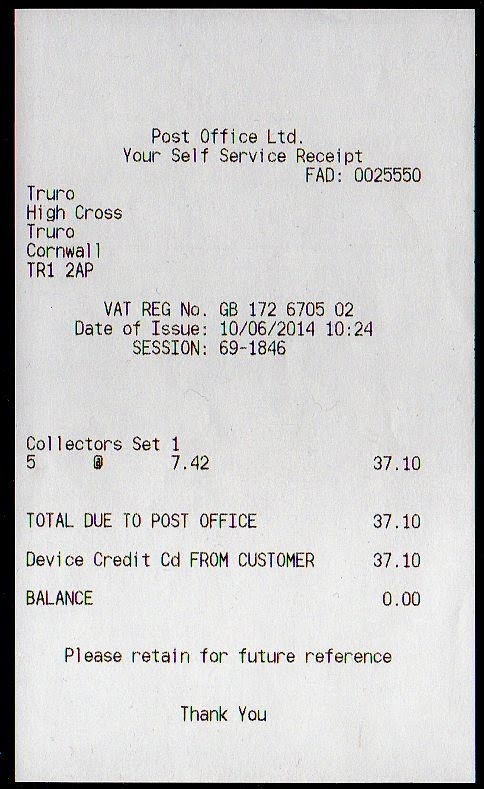 Truro PO tried to order Union Flag stamps for the NCR machines as an alternative to Machins and was unsuccessful. So they ordered Robins which were delivered last week. Whether they turn up anywhere else will depend on whether any other offices order them. Perhaps some of the doubters could persuade their nearest friendly NCR office to try as well ? I can only tell you what the people at Truro did. Until I go to Lowestoft and see at first hand, I rely on reports of others. So now we have sheet from London Bridge on ebay. The only ones I can find with a simple search are from Truro. Perhaps you could supply eBay item number ? I think this comment should have been sheep not sheet, it makes more sense . Spring Flowers with Europe 20g and Worldwide 10g from Halifax, Dundee and London Bridge are now for sale on Ebay. It appears that the NCR issued sheep were from London Bridge and bought on 13 June. Thank you. I find it highly implausible that London Bridge were able to obtain these, rolled for the NCR machines, from Swindon. I suspect some local re-winding onto a pre-used NCR core. I agree with your assessment of the issue of these sheep ncr stamps. This must be something that the PO should investigate, it is fraud or very close to it. As for the people buying these they should realise that these have no philatelic value and I would imagine no reputable dealer would touch them if they wished to sell at a later date. As for the person currently selling them they are doing a good job in destroying philately. London Bridge has also tried to order Robins today, see what happens. Any Robins at London Bridge yet? Or anywhere? Friday or Sat 27th would be the day that the order should arrive. Just to balance the previous comment, surely it makes sense to use up the old stock rather than waste it?. As long as people aren't being duped by unscrupulous NCR machine minders in cahoots with (or even being) e-bay sellers then I dont see what the problem is. Isn't it all part of the thrill of the chase, getting something different for your collection (although not at the prices being asked !!!) Eventually I suspect that a second class roll of machins will be put in the first class side (or 1st/Flags/Robins/pictorials in the 2nd class side) of an NCR machine in a genuine error (unless its physically impossible due to core sizes). Thats why I try and by a first and second class stamp from every NCR machine I happen across, just in case!!! !